At work, we use D-Bus to communicate from one process to another. However, when looking for information on how exactly to use D-Bus, the documentation that I came across was rather useless. So, here’s a tutorial on how to use D-Bus using both the official Java bindings, and C++ bindings using dbus-cxx. I recommend that you download the zip file containing all of the code used in this tutorial, as I do not give complete code samples in this tutorial for brevity, and because there is a lot of boilerplate code. The code samples are also fully commented in order to help you understand what is going on. For this, you’re going to need a few things. First, make sure that you have the dbus development headers installed. You can check this by using synaptic or whatever package manager you use. Next, make sure that you have dbus-cxx. You should check it out from the dbus-cxx SVN site; it is on Launchpad, but that version is out of date. There are directions at the dbus-cxx website. The examples on the dbus-cxx website are fairly useful, so that’s a good place to go for more help. Unfortunately, they suffer from a lack of explanation, so this tutorial will attempt to remedy that. For Java, make sure that you have the jar and the required files. This information can be found at the D-Bus website. I recommend that you also install qdbus. qdbus allows you to send out events and method calls on the D-Bus. qdbus can be installed by installing libqt4-dbus. Other useful utilities are dbus-monitor and dbus-send, which should be installed as part of the standard D-Bus installation. Let’s talk a little bit about what D-Bus is. In short, D-Bus is an IPC(Inter-Process Communication) and RPC(Remote Procedure Call) mechanism. This means that you use D-Bus to talk between processes. There are several other ways of communicating between processes, such as using a TCP connection between processes. On *nix based systems, you could also create a pipe to link two processes together. Shared memory is another option. Or, you could send signals from one program to another. All of these options have drawbacks and advantages. D-Bus takes a slightly different route, where all messages are sent through a central bus system and then forwarded on to the proper recipients, similar to how an IP packet works. Your output may differ. If you look at the terminal with dbus-monitor running in it, you’ll notice how there was a lot of output. Those are messages that are being sent over the bus. In fact, there’s too much to really go over now, so we’ll come back to that at a later point. The output from qdbus is a little more sensible. The services are identified by their names, i.e. org.freedesktop.Notifications. These are the bus names(note that these names must be unique). Now, let’s look at a specific service, in this case org.freedesktop.Notifications. The output that you get here are the paths. Now, let’s investigate the path /org/freedesktop/Notifications. As you can see, there are a few methods on here. NOTE: Not all of the methods here are shown. I am not sure why, but I believe that it is because qdbus cannot send to all of these methods. Notice how the first method that is shown is called Introspect. All objects that are on the D-Bus must implement this method. When called, it returns an XML string defining what methods are on this object at this path. So, let’s try calling the Introspect method. Notice how we now have a list of all methods that are on the D-Bus from the address org.freedesktop.Notifications and the path /org/freedesktop/Notifications. As you can see, there is also a new method called Notify. This method is what pops up the notification window in one corner of your screen. Depending on the version of the notification-daemon that you have installed, it may also allow you to click on it. dbus-cxx and dbus-java both have tools that help you make adapters from these XML documents. However, it’s also possible to make interfaces on your own, so we will not bother with the tools, as I think that it will make more sense to you if you don’t start out with the tools. So at this point, we now have a basic understanding of what is on the D-Bus, and how we can see what is on there. Let’s go and make some programs that talk to each other. Note: The sources can be found here . This includes projects already set up for Eclipse. To compile, simply make sure that you have libdbus-java-2.7.jar on your classpath, and when you run it make sure that you set -Djava.library.path=<path> to the location of unix-java.so if it is not set automatically. Note: The dbus-cxx library version 0.7.0 does not have support for variants. The SVN version contains variants(sending only) as of SVN version 193. Note: dbus-cxx 0.7.0 appears to hang when calling void methods. Thus, all methods we will call using dbus-cxx will return a value – this has been fixed in SVN, but there is no official release with this fixed as of this time. Let’s start with receiving messages first. For Java, any method that you want to export onto the D-Bus must be defined in an interface which extends DBusInterface. Here’s a simple interface, which will echo out whatever string we give it and return an int. What does this code do? Well, the first part gets a new connection to the dbus on the session bus(there is another bus, the system bus, but for most purposes the session bus should be good). Once we have a connection, we request a name. This name could be really whatever we want, but generally I use the Java package style. We now export an object onto the D-Bus. The first parameter is the path of the object. In the case of the notifications that we looked at before, this would be /org/freedesktop/Notifications. For simplicity, we are simply setting it to /. The second parameter is a class which implements an interface which extends the DBusInterface. Now, let’s look on the D-Bus to see what we have. There is the standard Introspect method, as well as an echoMessage method that takes a QString(this is the same as a regular string, but qdbus changes all of the types to types that are in Qt). 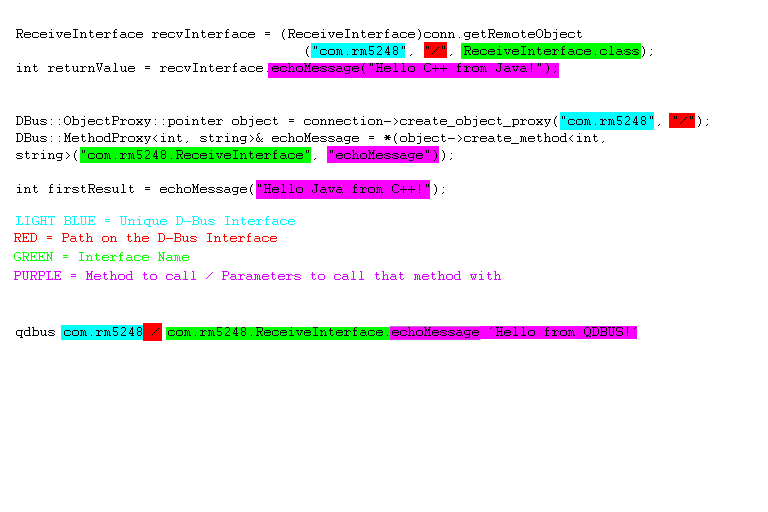 Now, let’s call the echo method using qdbus. If you look at the output for your Java program, notice how it has printed out the string ‘hello’! The ‘0’ that is printed underneath the qdbus call is the return of the method. Since we simply return 0, a 0 is printed. We call it the same way we called the echoMessage method, just with more parameters. qdbus will call the introspection information to call the right method, but this part of the output is the actual method call and return. Now that we have made some methods for Java and called them with qdbus, let’s now make a C++ program that uses dbus-cxx to do the same thing that we just did in Java. Now that we have made some methods to be called in Java, let’s make some methods to be called in C++. We’ll name the methods the same so that it’s easy to see the similarities between the two languages. To start out, let’s make our method. As in Java, we will take in a string, echo it, and then return 0. The implementation is essentially the same as Java, but let’s go over it anyway. Here’s the implementation, using printf as opposed to cout(because I like printf better). Simple, right? It’s essentially the same as the Java version. Now that we have this method, let’s go connect to the D-Bus, and export this method out. While the code is slightly more involved, it’s mostly boilerplate so there’s not much of an issue. Notice how we don’t pass the method address to the create_method method. We use sigc++ to get a function pointer which is used by dbus-cxx to call it. If we want to call a member function of an object, use sigc::mem_fun(object, object_method). The parameters to create_method are fairly straightforward, the first string is the interface name, the second string is the name of the method as it will show up on the D-Bus, and the pointer is the method that will be called. Before we can check to make sure that this works on the D-Bus, there is one last thing that we must do. We must make an infinite loop at the end of our main so that we don’t exit. While Java DBus will automatically keep the program waiting, dbus-cxx does not. I do this by simply including unistd.h and doing a sleep(300) inside of the loop. Because methods are called in their own threads(in both Java-dbus and dbus-cxx), there is no issue of deadlock. If we look at the output from qdbus, we will notice that is (almost) exactly the same as the Java version. Alright, we’re able to receive messages using both C++ and Java. Now let’s call methods from one to the other. Like the receiving portion, we first get a DBusConnection. Once we have the connection, we get a remote object from the connection. To do that, we specify the unique D-Bus address, the path, and the interface. In this case, this interface will resolve to com.rm5248.ReceiveInterface, which is exactly what qdbus shows as output. Note that when doing Java to Java communication the third parameter may not be needed, but it is always a good idea to add it just in case. Now, run the C++ program that we made in Part VI(receive), and then run your Java program. If everything is good, your C++ program should print out “Hello C++ from Java!” and your Java program should print out “0”. Awesome! We can now communicate from Java to C++. Let’s now go the other direction. Again, the C++ is slightly more involved, but about half of it is boilerplate code. So, let’s start out with the first half, which makes the D-Bus connection and gets a remote object. Excellent! We can now communicate Java->C++, and C++->Java. Note that Java->Java and C++->C++ are not explicitly stated; This is because we have already built these parts! If you run receive and then send, notice how you get the same output as we just got in this part. As well, if you run JavaReceive and then JavaSend, the two programs communicate perfectly. What are the types of the parameters? This information is given to us in the XML. In fact, it’s clearly stated. The interface is org.freedekstop.Notifications, and the type of the parameters is given in terms of D-Bus types. So, here’s a comparison between dbus-java, dbus-cxx, and the D-Bus introspection XML. Using this information, we can now make a Java interface. //the actual calling of the method would be here. Hopefully you can see how you use templates to make a method now. First, what is a signal? Basically, a signal is a method call that doesn’t return. A signal is also sent out to all programs which have stated that they would like to receive that signal. If you do not ask to receive a signal, you will not get it. It’s similar to a publish/subscribe paradigm. Now, while the rest of this tutorial has been showing you how to do something in Java first, it’s actually much easier to receive and send signals in C++. The way we do it is actually very similar to how we defined methods to be called before. We first do our standard init, and then after that we ask to receive a signal and give the method we want called when that signal is sent out. First, let’s quickly define our signal handling method. This signal handling method will take in an int, a string, and another int. Note that signal handlers [i]cannot[/i] return anything, so the return type is void. Here’s our signal handler. All the signal handler does is make sure the two ints are valid indecies into the string, and then print out the characters at those positions. Once it does that, it prints out the entire string. As you can see, there’s no real difference between defining a method to receive a signal and defining a method to be called. Now, let’s connect that signal up. Again, this is very similar to how we defined a method to be called, including the template arguments. However, we use a DBus::signal_proxy to catch the signal instead of a DBus::Object. A note about this code: you need to make a new DBus::signal_proxy for each signal that you want to catch. When we made a DBus::Object, you only had to make one object in order to export multiple methods. string "This is a long message with many characters in it"
Excellent! We have now received our first signal. Now let’s go and send out signals so we can receive them. Sending out signals is amazingly easy with dbus-cxx. Once you init your connection, just make a DBus::signal with the correct template methods, and the path you want to get the interface for. How to emit the signal is also very similar to how you call a method. Simply call the method as though it were a local method, and the signal will be sent out. The two parameters are as follows: The first one is the interface of the signal that we are looking for. On the D-Bus, SignalInterface.GenericSignal.class will resolve to com.rm5248.SignalInterface, with a member of GenericSignal. The next parameter is the signal handler. Signal handlers must implement the handle() function. The parameter to this function is determined by the generic type of the class. Now if we run this program and send signals out from either our C++ program or using dbus-send, notice how we now get a signal in both programs at the same time. If we run both the Java receive and the C++ receive as provided, we will get an error because they are both trying to use the address com.rm5248. Since these addresses must be unique, simply change one of the programs to request a different bus. Again, if we run both the Java signal receiver and the C++ signal receiver(with different D-Bus addresses), we will get the same signal sent to both of us. D-Bus is a very powerful IPC mechanism. There are a number of options which it gives you that you can use to connect different processes together. As a final note, you may download all of the files used in this tutorial here. Thank you very much for this tutorial, you saved me a lot of time getting into D-Bus. The provided example files are easy to understand and great to dive into the D-Bus ocean. Some people might have problems to install dbus-cxx (so did I on ubuntu). I tried to get it from SVN as recommended and got the latest stable version. While installing, the strangest errors popped up and after solving one, the next appeared. Thank you very much for this perfect tutorial! It is very easy to understand and useful for me. I have been looking for such documentation for a long time. Very nice and detailed sample usages that clearly and simply explain how D-Bus works. Based on your samples I also found the corresponding commands using dbus-send which comes with D-Bus. The reason was the hashmap mustn’t be empty. So I’ve added an “urgency” item and it’s working. Thank you for your work. Don’t know when this tutorial was written, but now in 2014 it’s still valuable – even though I’m writing in Scala. excellent tutorial, those examples just work….the only thing I had to do is linking libraries from /usr/share/java and to choose a correct java version on Ubuntu 12.04 x64…Just wondering what is needed to make it the recieve example a productive piece of code…!? – Instead of downloading dbus-java-2.7.tar.gz from http://freedesktop.org/wiki/Software/DBusBindings/, I installed dbus-java-bin via Synaptic. – Then I imported your examples as existing projects into my eclipse workspace. in Eclipse, right-click the project, Properties, Java Build Path, Libraries tab, remove ‘libdbus-java-2.7.jar’ and ‘JRE System Library [JavaSE-1.6]’ and Add External JARs… ‘/usr/share/java/dbus.jar’, and Add Library… ‘JRE System Library’ (workspace default). You need to set the java.library.path variable when starting up. Firstly, thanks for your share. Could you give me more messages about “For Java, make sure that you have the jar and the required files. ” What is the jar and the required files? Because I met some error when I run the examples. The required files are the libmatthew jar files that are needed to run the examples. These jar files must be on the classpath. I was unable to get SVN revision 213 to compile. Rolling back to rev. 207 removed the offending code, but it might be worth taking look to make sure what you committed was what you intended. What compiler/distro are you using? I’m using gcc 4.8.2 on Ubuntu 14.04 (arm-linux.gnueabihf toolchain). I’ve also tried compiling on my development machine, which has gcc 4.8.4 on Ubuntu 14.04 and Intel i386-linux-gnu toolchain. Both have the same complaint. Even after building rev. 207, I still can’t get either dbus-cxx-introspect or dbus-cxx-xml2cpp to do anything useful. The former hangs and the latter produces no output. I will take a look at it at some point, but it may be a few weeks before I have the time. If you are willing and able to look at the code and figure out what is wrong, send a patch to the dbus-cxx mailing list and I can apply it. I can probably afford to spend a small amount of time on it. If you can tell me the file name and line number of the function that matches the signature “signature(DBus::Type)”, I’ll start from there. I just took a quick look at it, that error is only in the tools. Earlier versions should work. Otherwise, try this patch, and we can move the discussion there or to the mailing list, since this is getting too deep for wordpress to handle. Sorry to keep bugging you here. Perhaps you didn’t see my comments on github. And I’ve been waiting since September for access to the mailing list, so this is my only choice. Is there any documentation on using dbus-cxx to send user-defined data (i.e. a struct). Oh, I didn’t realize that stuff was broken on Sourceforge. I’ve asked my question of the new group, which so far consists of exactly me.